The C-Tec 800 Series Call System is a conventional call system which is ideal for nursing homes, care homes, hospitals and doctors surgeries. This system features a wide range of peripheral devices which can be used to initiate a call onto the system. The C-Tec 800 Series Call System call controllers in a variety of sizes depending on the system size requirements. There are also various reset points available in different finishes and resetting options, including magnetic swipe reset and key reset. The C-Tec 800 Series Call System is easy to install and comes supplied with installation instructions. 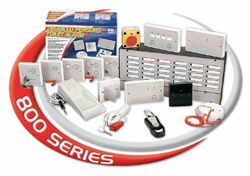 If you’re interested in this system you may also be interested in the C-Tec Quantec Call System and our Fire Alarm Cable ranges.